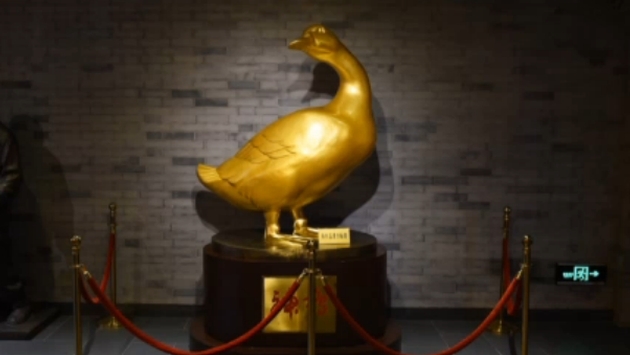 China’s ongoing love affair with Peking duck has spawned a museum installation that is dedicated to the fowl feast. NBC News’ Ian Williams reports on Quanjude restaurant, which is serving up more than just food, because it has carved out a piece of its Beijing restaurant to offer up some history. According to the report, the restaurant, of which there are now “about 100 branches worldwide,” is celebrating its 150th birthday by opening an homage to its greatest item. It’s rather odd to have a museum dedicated to a food item, as if McDonald’s displayed a Chicken McNugget under glass case at its locations. In this case, it makes tremendous sense. In the case of the Quanjude brand, 200 million of the dish, an estimate, have been sold to customers over the years. A guide relayed to Williams that upwards of 2,000 ducks might be served in a single day, so avert the eyes from any waddling, feathered friends that might be nearby. As for the museum, it is reportedly 1,200 square yards and features displays that depict preparation as well as pictures of world leaders enjoying the dish, so you can see what important people look like when they are stuffing their respective faces. That’s just fine, because there is simple no way to replicate a process that is hundreds of years in the making. For those fortunate enough, there is a Beijing restaurant that promises to fill the mind and the belly with the good stuff.